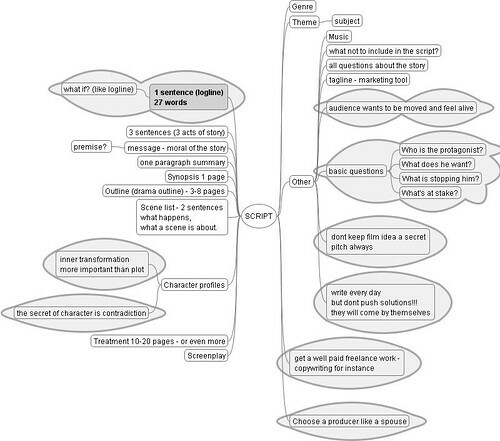 Above is a mind map picture with main rules which should be followed if you want to write a script. The list of rules can overwhelm a novice writer. If he decides to follow them it’s highly likely that his work will be average at best. After reading several books on screenwriting I came to the conclusion that all great script has only 2 things in common. Ironically it seems emotions shouldn’t be guided by an almost mathematical defined structure. But the fact is: the more the structure is embedded into the story the less it is obvious. The more emotions and structure are united the more we have the feeling that the film just flows. The viewer would have a hard time to analyze the structure apart from emotional impact that he just experienced. A good example is a film Lost in Translation. Majority enjoys the story (emotional impact) but has a hard time to tell the story in a paragraph.